Group 78. International Contemporary Art in Trieste organizes a video review of contemporary art projects documentaries of over 42 international artists working in new technologies. The artistic selection was created by Martín Romeo, and is distributed within two days in the Immaginario Scientifico Museum in Trieste, where art, new technologies and science are told and explained by the artists themselves. Screening Festival – Arts Based Research is an innovative appointment, a trip to the visual vanguard experimentation. The video documentaries will reveal the process of construction of the contemporary opera showing the path, the research and the idea undertaken by the artist to achieve the complete and final form of his work. 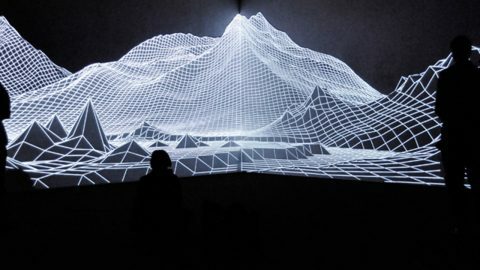 The artists scheduled work with multimedia, interactivity, electronics, to the union of several disciplines, as in the case of Fred Penelle & Yannick Jacquet, while the works of Joanie Lemercier speak of optical and sensory illusion, interactive dance is experienced by Adrien M and Claire B, instead the digital landscape is investigated by Quayola. Raul Alaejos & Rodrigo Calvo (ES), United Visual Artists (UK), Caitlind r.c. Brown & Wayne Garrett (CA), Janet Echelman & Aaron Koblin (US), Quiet Ensemble (IT), Everyware (KR), Varvara Guljajeva & Mar Canet (EE/ES), Robert Henke (DE), Bart Hess (NL), Peter William Holden (UK), Random International (UK), Johan Knattrup Jensen, Mads Damsbo e Dark Matters (DK), Lab212 (FR), Joanie Lemercier (FR), Hellicar & Lewis (UK), Daito Manabe & Motoi Ishibashi (JP), Kyle McDonald, Joanie Lemercier e Joel Gethin Lewis (US/FR/UK), Chris Milk (US), MIT Media Lab (US), Adrien Mondot & Claire Bardainne (FR), Carsten Nicolai (DE), Pablo Palacio & Muriel Romero (ES), Lisa Park (KR), Fred Penelle & Yannick Jacquet (CH/BE), Lorenz Potthast (DE), Matt Pyke (UK), Quayola (IT), Casey Reas (US), Pedro Reyes (MX), Martìn Romeo (IT), Daan Roosegaarde (DE), Lillian Schwartz (US), Berndnaut Smilde (NL), Yuri Suzuki (JP), Nervous System (US), TheGreenEyl (DE), Patrick Tresset (UK), UBIKteatro (IT), Umbrellium (UK), Hiroaki Umeda (JP), Nils Volker (DE). Screening Festival intends to show the different stages of artistry within multimedia, with the intent to tell the public about the operation of new technologies, from robotics to programming, through the background and backstage of the creations. A documentary vision that is a metaphor for the methodology used in the contemporary to represent its projects. Cross-media research and interaction will dominate, approaching a world marked by extraordinary technological potential, from fiction and illusion. Thanks to: ARTtube, Eyeo Festival, Mana Contemporary, Romaeuropa, Shapeways, The Creators Project, The Office for Creative Research e University of Salford. After Trieste, Screening Festival will be in Venice from 5 to 8 December 2015 at Officina Delle Zattere – Fondamenta Nani, Dorsoduro 947.